Steel body with satin novelty and polished surfaces covered with black titanium carbide. A dark gray flange is tachometer scale. The asymmetrical design of the case is based on a model Carrera Mikrogirder – it has a small rise to the top, where are placed the crown and chronograph pushers. Back of the watch with smoked sapphire crystal decorated autograph and Jack Hoera family crest. Through the clear glass can observe the work mechanism Calibre 1887 by 39 stones. 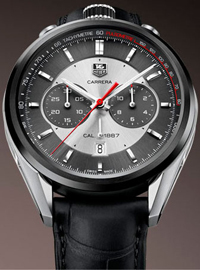 Equipped with caliber frequency 28,800 vibrations per hour, and a 50-hour power reserve. Number of movement parts – 320, a special place of which is the swinging gear, invented in 1887. The interaction of oscillating pinion and column wheel reminiscent of the work of transmission in a car. Column wheel that controls the functions of start, stop and reset the chronograph watch performs in the role of a transmission. A swaying gear plays the role of coupling.